Whether you’re a photographer presenting an intimate workshop for five students or a seminar in a hotel ballroom for five hundred, it’s better when you tether. Shooting tethered allows you to be presenting your images on a large screen, be it a monitor or a screen via an overhead projector. As the educator, you can setup a shot, take the picture, then have your shot show up and speak to the details in the lighting, composition, and overall stylistic choices that you made. Then, as you move and adjust lighting, change camera settings, or coach the model, the class can follow along and see how these changes affect the look and feel of the final image. A photographer can describe their favorite technique at great length, but photographers are largely visual learners and seeing is believing. Add a large monitor or HDTV up front on stage and your class with thank you. It’s actually quite easy to setup, and there’s a few different ways to go about it. In addition to the USB port on your camera, you may have noticed that most DSLR or medium-format digital back cameras also have an HDMI port which can allow you to ‘shoot tethered’ to an HDTV. There are some drawbacks, most notably that you’re not transferring data, and that your simply mirroring your camera’s display. If you had planned to discuss Lightroom presets as part of your presentation, this isn’t for you. But, if you want foolproof check out this article on TetherTalk.com titled, “How to Shoot Tethered to a HDTV” for detailed instructions on how to set up the TV and cable. This may be the most common setup for presentations, and there’s a few good reasons why. First, is your students want to see real-life examples of how you, the photographer and educator work, and this setup is a reflection of that. Second, if you want to move through images, set presets, do touch ups on the fly, etc. 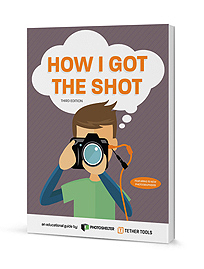 this allows you to work in Lightroom or Capture One and let your class experience your workflow. Tether Tools has several products that will mount everything from monitors to iMacs, and VESA compliant to non-compliant VESA monitors. Depending on what type of monitor you want to use, you’ll need an appropriate mount. In the article, “Mounting a Monitor In Studio or On Location Made Easy” we go over the different variations of monitor mounting solutions, and how to make it work for you. This setup is similar to the previous setup, but instead of routing the laptop to a monitor the educator would route their laptop to an overhead projector. First things first, contact the AV representative at the venue for assistance. 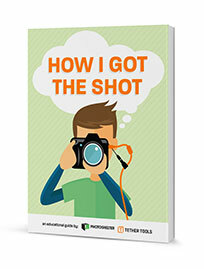 You’ll want to shoot tethered to your laptop, and then from there you’ll want to discuss with the venue what type of ports the overhead port uses so that you’re not caught flat footed the day of the event. With so many different projectors on the market today the ports available is a variable, although HDMI is very common. And remember, if you’re using the new MacBook Pro you’ll need a multiport adapter that has both a USB and HDMI port. Do you train and educate other photographers? 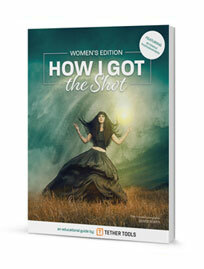 Are you teaching workshops and seminars for associations, photographer groups, and other organizations? If so, Tether Tools would love to support your endeavors. 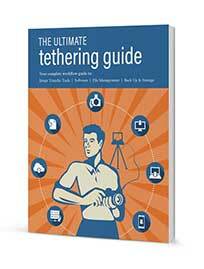 Tether Tools offers gear at a discount to photographers who are teaching workshops through our Photo Educator Program. Tether Tools is also committed to helping educators and students access the proper equipment to help pursue their passion for photography and filmmaking. The Tether Tools EdVantage Program offers education, consultation and discounts on many of Tether Tools most popular product lines. If you’re a currently enrolled student or educator in a high school level arts program, or an accredited college-level art, photography, film, graphic design, audio, or new media school, check out our EdVantage Program to learn more.